She was one of 20 youths who were honoured for their "kindness, compassion and service." When Peterborough, Ont.-native Faith Dickinson was only nine years old she made a blanket for her aunt who was in treatment for stage IV breast cancer. Five years later, she's sent more than 3,500 fleece blankets around the world on behalf of her charity, Cuddles for Cancer. 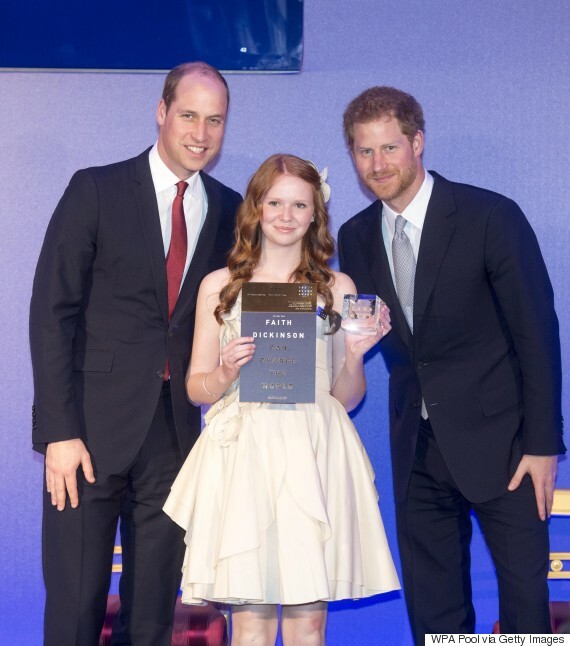 On Wednesday, the 14-year-old arrived at St. James's Palace in London where she was honoured by the late Princess Diana's sons, Princes William and Harry, with a Diana Award. Dickinson was among 20 youths who were honoured for their "kindness, compassion and service." "One of my mottoes is 'You're never too young to make a difference,'" Dickinson said after receiving her award. "And I think that this really proves it." Though Dickinson's organization started out specifically for cancer patients, she has since expanded to provide blankets to soldiers experiencing PTSD. "Prince William told me that I was just doing such an amazing thing," Dickinson recalled with pride. "And Prince Harry told me that I was the most impressive redhead there tonight." The Diana Award was established in 1999 in honour of the late Princess of Wales. It is awarded to individuals or groups between the ages nine and 18.